Community immunity, also known as “herd immunity,” is when the majority of a community is vaccinated and able to protect those who are unvaccinated. When most people are immunized, diseases can’t spread as easily. This protects the few among us who are not immune. It is important that those of us who can receive vaccines do so in order to protect those who cannot. Among the unvaccinated are people whom we know and love: babies, who are too young to be immunized; people with weak immune systems due to disease or medical treatments, like chemotherapy; pregnant women; senior citizens; and anyone allergic to a vaccine. For diseases like measles and pertussis, about 90% to 95% of people in your community must be vaccinated to shield the people most at risk. For some diseases, like polio, an 80% to 85% vaccinated rate may be enough. 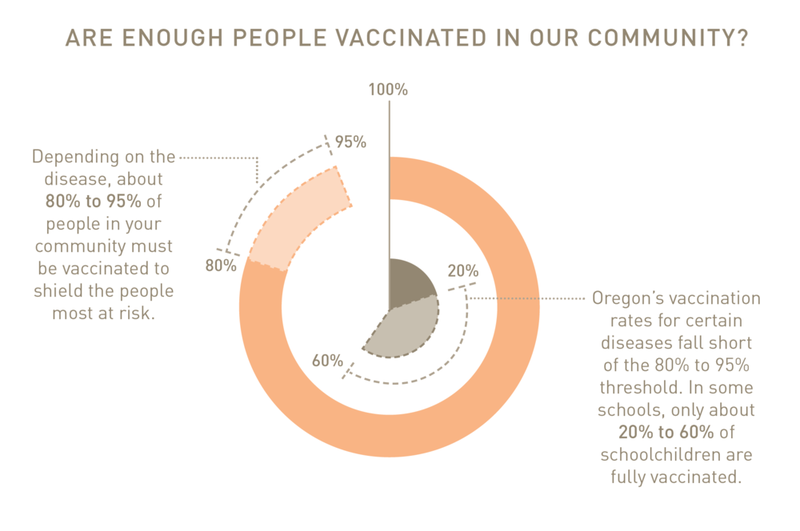 Oregon’s vaccination rates for certain diseases fall short of those thresholds, and some schools have as many as 40% to 80% of children missing vaccines. Your child or community could be at risk. Vaccinating your child and yourself is a wonderful way to benefit your family’s health, as well as the health of your friends and neighbors. “My son, Pete, was diagnosed with a pineoblastoma (a very rare and aggressive brain tumor) just before his second birthday in 2005. This diagnosis gave him only a 5% chance of survival. He underwent several surgeries to remove his tumor. Then we began treatment that lasted a year and included several different types of chemotherapy drugs and radiation. Of course, these poisons administered to Pete were to kill his cancer, but they also took a toll on his little body. There were many times his blood counts were so low that his immune system wasn’t able to protect him at all. During these times, it was super scary because he was extremely susceptible to catching any type of illness. If we went out, Pete had to wear a mask to try and put a barrier between him and the outside world. People would look at him and step away like they thought they would catch something from him. Yes, Pete had received his appropriate vaccinations. But I don’t think people understand that when they choose not to vaccinate their children, they are not only affecting their own families, they are also putting others (like Pete) at risk. While Pete was on treatment, we knew several families who lost their children, not because of their cancer, but because of illnesses they caught while their immune systems were compromised from their treatment. Pete is now 10 years old, healthy, cancer free, and his immune system is protecting him again. But there are countless other children just beginning the fight for their lives. Herd immunity is the only way to protect these kids." Next: So, Why All the Fuss?